Although this wasn’t my first Christmas away from England it was my first away from my family. It was also my first in a non-Christian country so I was interested to find out what it would be like. Although we were meant to have class, our teacher gave us permission to miss it for the day. 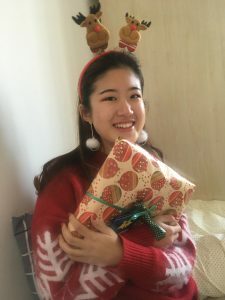 On Christmas morning, after waking up, some friends came to my room and we gave each other presents. I got a new white woollen jumper, a pair of black leather shoes and lots of small things (mainly food and drink). I gave my girlfriend a pretty red dress. We then met with some other friends for brunch in the Hutongs by Gulou Dajie. Some people were wearing Christmas jumpers, others were wearing Christmas hats, I had both! The restaurant was quiet and a little empty. 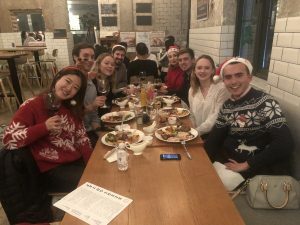 We were the only ones celebrating Christmas which seemed strange, but we put on some Christmas music to make the atmosphere more lively and festive! The food and drinks were very good. 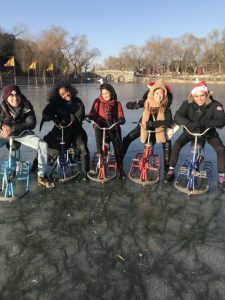 Then we went to Beihai park, walked a little and went ice skating. 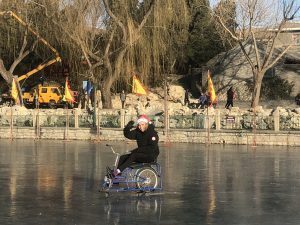 They also had special bicycles that you could use on the ice, which were very fun! 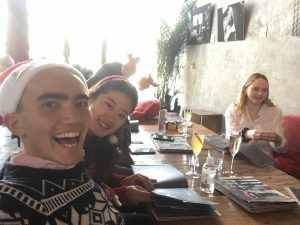 After that we took a taxi to Beijing’s Chaoyang District and had an English Christmas dinner. 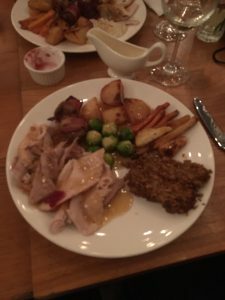 It had everything: roast turkey, roast potatoes, carrots, parsnips, Brussels Sprouts, sausages wrapped in bacon, cranberry sauce, gravy and even bread sauce! We also had a few glasses of mulled wine and a few bottles of red wine. After eating, I was stuffed, and had no room for Christmas pudding. It really was a wonderful feast. Afterwards we played some fun games and then went to a small bar nearby for a few more drinks before returning to the dorms! A very long but very fun day!